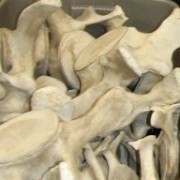 Adopt a Bone to Help the Marine Life Center! The twin focal points of the Marine Mammal Gallery will be complete re-articulated skeletons of an Orca (Killer Whale) and a California Gray Whale. The specimens, already clean and in hand, will be assembled in place once their gallery has been completed. You have the opportunity to adopt bones or skeletons for a tax deductable contribution. Your name and your bone will be identified on a commemorative plaque displayed permanently in the museum. Bones are priced for every budget and donors of $500 or more will receive a realistic resin cast of one of our killer whale’s teeth. Adopt today!